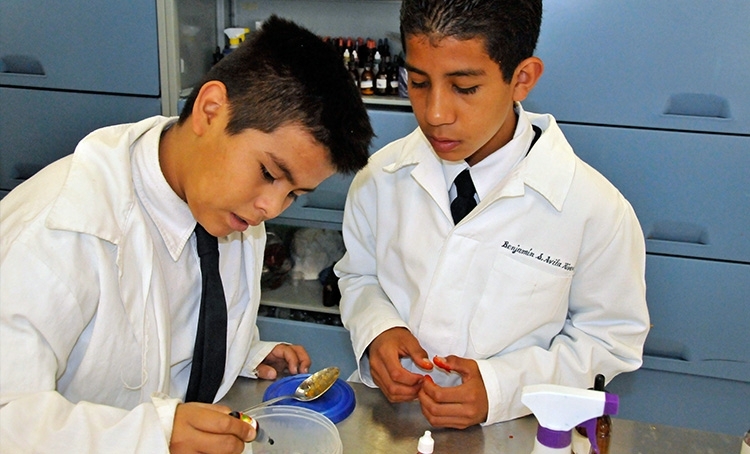 ”On a trip to Christel House in Mexico City, we visited the ninth grade chemistry class. It was unlike any chemistry class that we had ever experienced. We first noticed that each student was wearing a starched white lab coat over his or her uniform. The student's name was stitched in black over the pocket, giving the students a remarkably professional appearance. Just learning how to dress the part of a scientist is an important lesson for students who likely have never before seen anyone dressed that way. But we saw something else in the lab that made a lasting impression on us. These students were not mixing chemicals that create smelly gases or the scent of strawberries. Working in small groups, each with different a task, they were making soap. Some were carefully measuring and mixing chemicals to get just the right consistency and color in the end product. Others were pouring the resulting mixture into molds incorporating various symbols and logos. Still others were placing the soap in boxes. All were carrying out their tasks with care and enthusiasm. At the end of our visit, the students proudly gave us a bar of the soap they had made.